Huế (help·info) (化 in chữ Nôm) is the caipital ceety o Thừa Thiên - Huế province, Vietnam. Atween 1802 an 1945, it wis the imperial caipital o the Nguyễn Dynasty. It is well kent for its monuments an architecture. Its population stands at aboot 340,000 fowk. 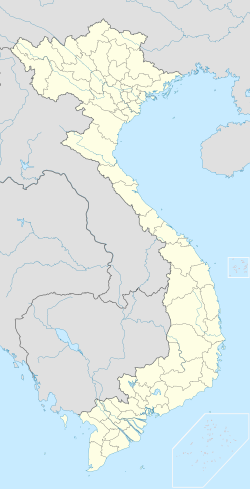 Huế originally rose tae prominence as the caipital o the Nguyễn Lords, a feudal dynasty which dominatit muckle o soothren Vietnam fae the 17t tae the 19t century. In 1775 when Trịnh Sâm captured it, it wis kent as Phú Xuân. In 1802, Nguyễn Phúc Ánh (later Emperor Gia Long) succeedit in establishin his control ower the whole o Vietnam, therebi makin Huế the naitional caipital. Huế wis the naitional caipital till 1945, when Emperor Bảo Đại abdicatit an a communist government wis established in Hà Nội (Hanoi), in the north. While Bảo Đại wis briefly proclaimed "Heid o State" wi the help o the returnin French colonialists in 1949 (although no wi recognition frae the communists an the full acceptance o the Vietnamese people), his new caipital wis Sài Gòn (Saigon), in the sooth. In the Vietnam War, Huế’s central position placed it vera near the border atween North Vietnam an Sooth Vietnam; housomeivver, the ceety wis locatit in Sooth Vietnam. In the Tết Offensive o 1968, durin the Battle of Huế, the ceety suffered considerable damage no ae to its physical features, but its reputation as well, maist o it frae American firepouer an bombings on the historical buildings as well as the massacre at Huế committit bi the communist forces. Efter the war’s conclusion, mony o the historic features o Huế wur neglectit acause they wur seen bi the victorious regime an some ither Vietnamese as "relics frae the feudal regime"; the Vietnamese Communist Pairty doctrine offeecially described the Nguyễn Dynasty as "feudal" an "reactionary." There haes since been a chynge o policy, housomeivver, an mony historical auries o the ceety are currently being restored. Wikimedia Commons haes media relatit tae Huế. This page wis last eeditit on 22 Mairch 2019, at 10:25.